Walking in Ireland was just as delightful as I had anticipated. Starting in Dublin and right on out to the countryside. With my well-broken in shoes and new walking stick, I felt right at home rambling along. 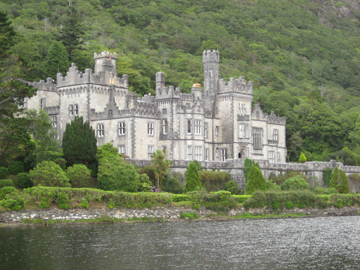 We visited Kylemore Abbey. The main house was stunning but I particularly loved the gardens. 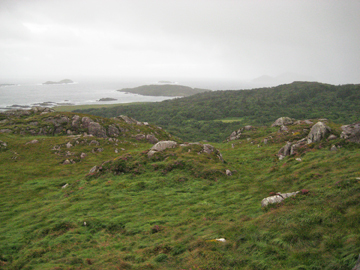 We also went to Connemara National Park. And, every day, there was always tea! I had an absolutely fantastic time in Ireland! I loved the people, the food, the scenery the hotels and the history! 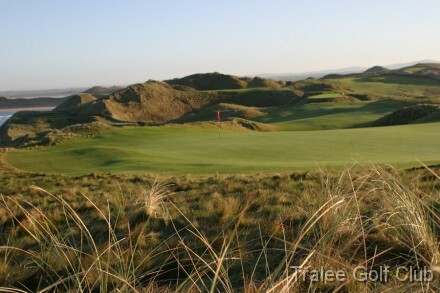 After writing up Bob's rather pathetic golfing tales of Ireland, I realized that it would be helpful if I gave you our itinerary. Our first two days were spent in Dublin. 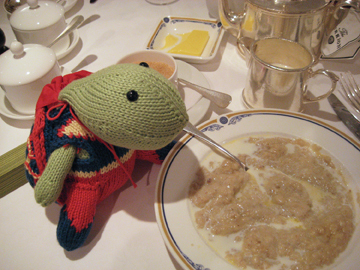 Sheldon enjoying his morning porridge. 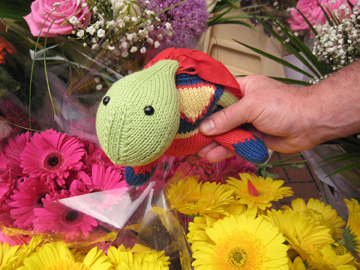 And, admiring the offerings at a flower stall. Notice the bright yellow butter!! Oh, I love Irish butter!! Here are a few of my highlights! Starting with Dublin. I love the city walks that are available in so many places. We went on an Irish Writer's Pub Crawl and a historical walk the next day. Even on our own we did well because Dublin is one of those perfectly walkable cities. 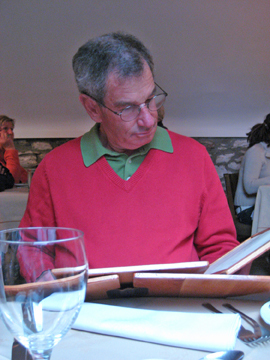 Even though Bob's taste run to haute cuisine, I like good old comfort food after a long journey. So, Bob caved in and we had a very good pub dinner - Shepherd's Pie for me and Irish Stew for Bob. The next night Bob found a restaurant that had only been open for a week! It's called Bentley's. It was so good that we made a reservation for the night before we headed back home! 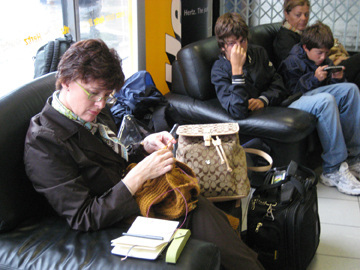 On Monday morning, while Bob stood in a very long line at the car rental, I entertained myself with my Aran Cardigan! 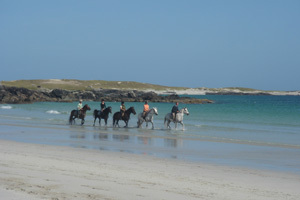 Then we headed west to Connemara! In Connemara we stayed in a country house - Cashel House. It was love at first sight for me!! Like walking through a time portal. 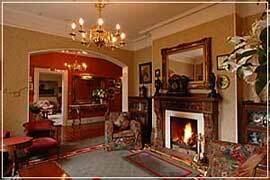 Lots of little sitting rooms with warm peat fireplaces. Peat fireplaces!! Floral wallpaper, lots of photos on the wall, trinkets on the little tables and the mantle, overstuffed furniture and absolute silence! 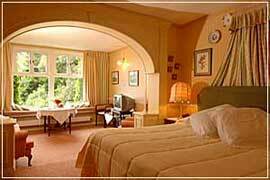 The bedrooms were equally charming! The entire experience made me think of the lives of the ladies in my beloved Jane Austen novels. I know, it's Ireland, not England, but I imagine country life would have been much the same in both countries. What a life for the women to be so isolated. No wonder they all played the piano well! Still, it must have been terribly lonely. For a vacation, it was a perfect situation. After dinner, we would sit in a sitting room with the peat fire crackling and read. On Friday we drove to Kenmare. It was a bit difficult to appreciate the small bit of the Ring of Kerry drive between our dodging the tour buses and the bicyclists. 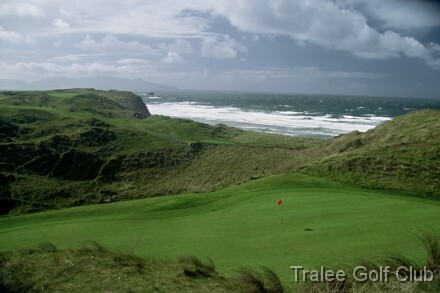 The views as we drove to the Waterville Course and Tralee were more enjoyable thanks to the lack of traffic. We stayed at Sheen Falls Lodge just outside of Kenmare. My empathy with Jane Austen's world contined because we could actually walk to town from the lodge. I felt like Elizabeth Bennett! Sheen Falls is much more modern then the country house. It is very nice but I much preferred the shabby chic comfort of Cashel House. By the time we got to Kenmare, the weather had deteriorated. A couple of the days it rained so hard that we were "forced" to sit around entertaining ourselves - Bob with reading and me working on my Aran Cardigan. Yes! I did finish it before it before we headed home. Well, I didn't finish the buttonband because I wanted to get the opinion of the ladies in the office. I wasn't sure if I wanted to put in buttonholes or use a clasp to close it. The vote went for leaving off buttonholes. And, I'm very glad because cardigans closed with stick pins were all over the place at Stitches Midwest. I bought one specifically for the cardiagan. I did take some video of cutting the front steek and I will edit it in the next couple of days. It was so strange to wander in the shops filled with beautiful Aran sweaters knowing that I had my own waiting for me back in the hotel. I certainly didn't have any desire to buy one. But, the thick, colorful, tweed socks were very tempting as the temperture continued to go down each day. The linens, on the other hand, were definitely something I could justify purchasing. Practicality, and the exchange rate of the Euro, influenced my decision to buy four handkerchiefs. Well, there may have been a bit of Austen romance involved. It seems so much nicer to have a linen handkerchief in my purse than bits of Kleenex. On Wednesday we drove back to Dublin for our last night in Ireland. Bentley's was just as good the second time! And, we got to try new desserts!! Waaay too much traveling going on the last few weeks! 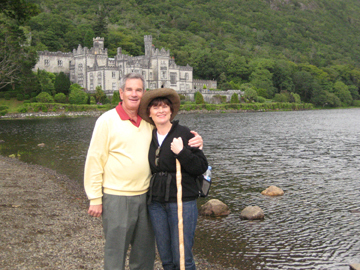 After Bob and I returned from Ireland I only had a few days before Tina and I took off for Stitches Midwest. After a couple of days in my office, sustained with many cups of coffee, I am caught up enough to be able to enjoy some blogging time! And, here are the shots I took. Now please understand that I absolutely loved every minute of our trip! I'm just sharing Bob's experience. The guy really needs to take up knitting, study of history and classic novel reading. Then he would have had as much fun as me! I had intended to do a lot of horseback riding on this trip. In fact, that was one of the reasons we chose to visit Ireland. But, we ran into a couple of problems. The first was logistical. Most of the riding stables were at least an hour's drive in the opposite direction of the more than an hour's drive to each golf course. The second, as you will see, was the weather. After the ride, I began what was to become my golfing wife routine. I had someone give me a ride to the golf club, my shaky legs certainly weren't up for the walk, and I settled in for a nice long knitting/audio book session. Let's talk about scones! Scones with strawberry jam! Scones with strawberry jam and clotted cream!! Scones, strawberry jam, clotted cream and a pot a super hot, super strong tea!!! 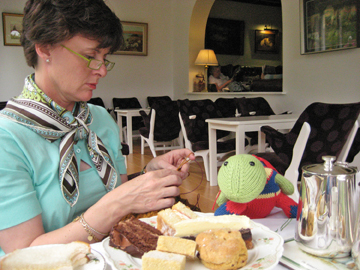 Then, when I got really hungry, a plate of tea sandwiches with fresh pot of tea! 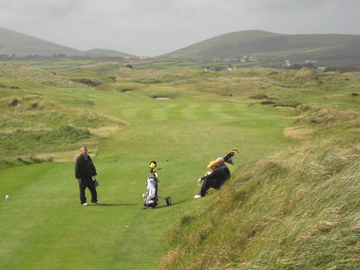 The view of the Connemara Golf course was spectacular as was the view of the other two courses Bob played. Since the courses were all quite a long drive from our hotels, I decided that I would go with Bob, enjoy the scenery, sit in the warm clubhouses, knit and eat. That turned out to be a very good plan because the weather deteriorated over the course of our visit. 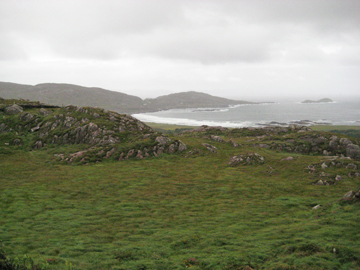 In Connemara, Bob only had to contend with strong winds. 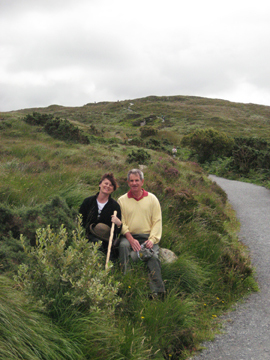 By the time we got to the Ring of Kerry, he had wind and a little bit of rain. 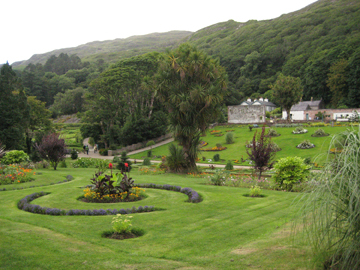 After we left County Galway we went around a bit of the Ring of Kerry to the town of Kenmare in County Kerry. 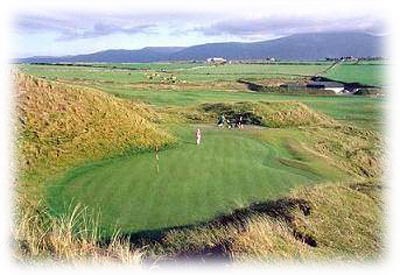 From our base in Kenmare we went to the Waterville Golf Links. I spent several pleasant hours in the clubhouse. The Christmas tree is a give-away that I used one of their brochure shots. But, you can see that it was a nice place. The day after Waterville, Saturday, it was absolutely pouring down rain so we hung around the hotel. Then, even with threats of wind and rain, that came true, Bob insisted on heading out to Tralee. 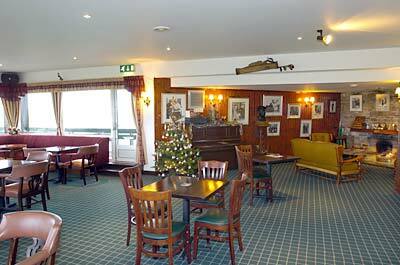 I couldn't find any photos of the clubhouse so I will give you a few extra course shots. Now, I realize that this all sounds a bit negative but Bob did find solace in the absolutely fantastic food we found in Ireland. I know, you don't usually equate Irish food with high cuisine but there have been several new developments. First, Ireland has been experiencing an economic boom the last twenty years. More money to spend on good food. The new no-smoking bans and extremely strict drinking and driving laws have effected many pubs. They have changed to gourmet restaurants in order to stay in business. All to the good as far as Bob was concerned. Our hotel in Clifden included dinner but the rest of our stay was a treasure hunt for ideal meals. One of Bob's favorite activities. 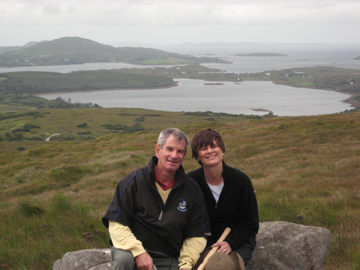 So, even though he had weather challenges on the golf courses, he had wonderful food and we were able to spend a lot of time together enjoying Ireland. I had an absolutely wonderful time in Ireland. But, Tina and I are leaving for Stitches Midwest (Chicago) early tomorrow morning. We will be at the Meet and Greet Thursday night and then enjoy wandering around on Friday and Saturday. I am so excited about hanging around with hundreds of knitters! The energy at big gatherings is just a joy! I promise that when I am back in the office next week I will be able to tell you lots of stories about our adventures in Ireland. I did finish my cardigan and I am in love with it!!! I've become completely obsessed with my Stonington Shawl. I can't explain it because it is just miles and miles of garter stitch. I guess it is the feel of the Shimmer yarn and the way the subtle colors are working into the fabric. I will be taking it with me to Chicago. Just the ticket for knitting while we travel and as I sit quietly in my hotel room at the end of the day.